Quitting smoking is hard regardless of age, but it can be particularly challenging for seniors who have relied on lighting up for decades. 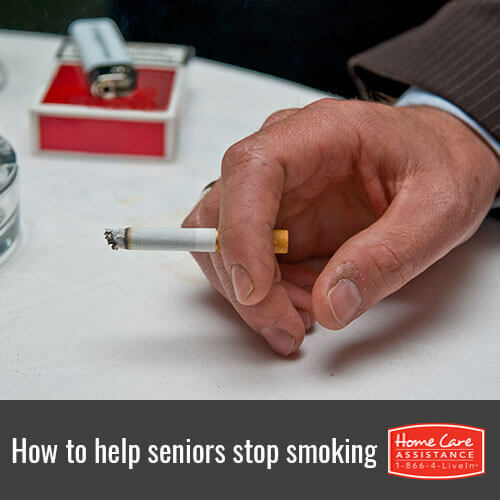 Here are a few tips to share with your senior loved one that can help him or her put down the cigarettes for good. 1. Create a support network. Rhode Island elder care professionals encourage you to tell friends and family you want to quit smoking. Ask for their help to keep you strong and determined. Suggest specific ways they can lend assistance. Consider joining an online support group as well. 2. Write down your reasons for quitting. This will help strengthen your resolve. Referring to it during the quitting process will remind you why you’re working towards this goal and keep you motivated. 3. Consider contacting a quit line. A quit line is a smoking cessation service available through a toll-free telephone number. Quit lines are staffed by counselors specifically trained to aid smokers. Quit lines provide information, advice, support, and referrals to people nationwide. The service is sponsored by the US Department of Health and Human Services. When you call, you’ll speak with a counselor who will help you develop a personalized quit plan. You’ll be provided with self-help materials, and you can also obtain a referral to a local clinic. Quit line services are free. The national quit line number is: 1-800-QUIT-NOW. 4. Set your quit date. By scheduling a quit date, you’re mentally preparing yourself for what’s ahead. Don’t wait too long to commit yourself or you’ll lose your motivation. Mark it on your calendar as a form of declaration. To increase the likelihood of success, try tapering the daily number of smoked cigarettes rather than attempting to go cold turkey. This will build confidence in your ability to completely quit. For more information on senior health, reach out to Home Care Assistance at (401) 284-0979. We provide hourly and live-in care, in addition to specialized stroke, Parkinson’s, Alzheimer’s and dementia care in Rhode Island. Our caregivers can offer companionship and emotional support, as well as provide transportation to medical appointments or support groups. Call us today. We look forward to speaking with you.